Holy yum! This is one of those recipes you can make on the fly because it's super easy and the ingredients are an open book, I just used whatever I had on hand! Perfect for a light dinner on a warm summer evening. It's also loaded with lots of veggies and protein. I wish I could take credit for the sauce, but the applause goes to Trader Joe's for their amazing turmeric dressing made with almond butter. Turmeric has been used in India for thousands of years as a spice and medicinal herb. It has powerful anti-inflammatory effects and is a very strong antioxidant! Not only does it offer so many benefits for your body, but also throws a hell of a party for your taste buds! 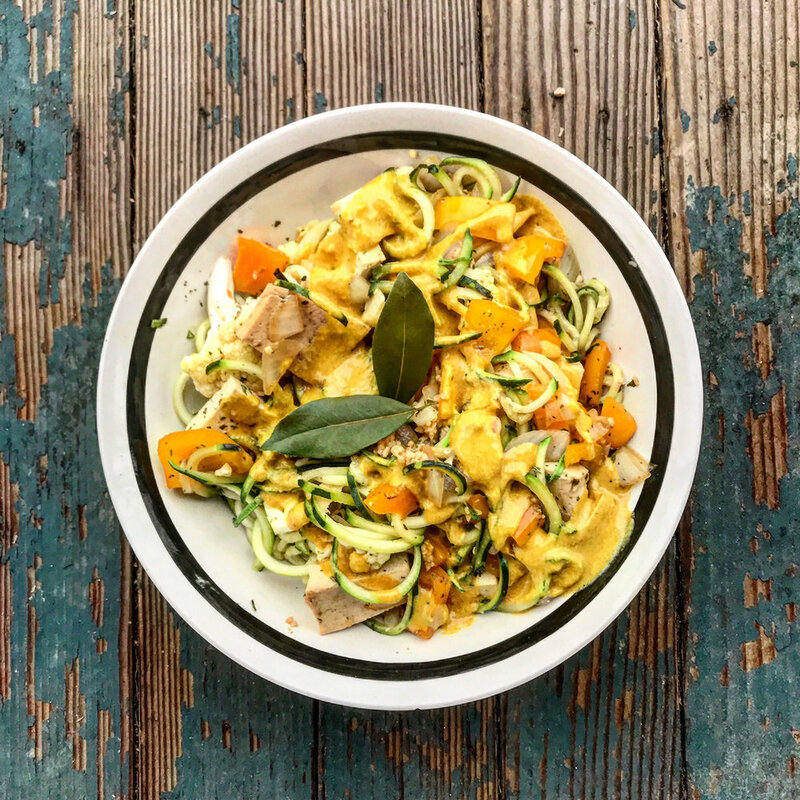 2 medium zucchini squash (use a spiralizer to make into noodles. If you don't have one you can usually buy zucchini noodles at the grocery store in the produce section). 1. Heat a pan over medium-high heat with 1 tbsp olive oil. 2. Saute the onions and garlic until onions become translucent. Then add in the mushrooms and tofu. Saute until the tofu is golden brown. 3. Add in the orange and yellow bell peppers, lemon juice, and zucchini noodles. Lower the heat to medium and cook until peppers and noodles become soft, about 10 minutes. 4. Mix in the fresh basil and turmeric dressing (as much as you'd like) serve and enjoy!